Justin D. Hodson, CPI owner and lead investigator of Hodson P.I. 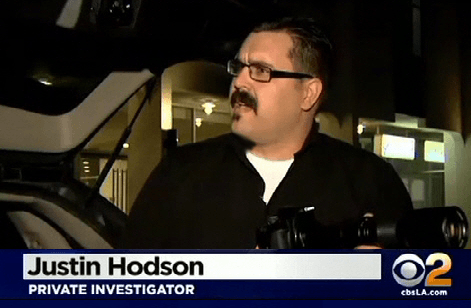 Professional Investigations was interviewed by CBS 2 News in front of the Hodson P.I. Offices about the truth of infidelity and Valentine’s Day. “The truth about Valentine’s Day”, said Hodson, “Is that the real investigation work picks up in the days after Valentine’s Day”. Justin D. Hodson, CPI Owner of Hodson P.I. Professional Investigations in Fullerton, California. He said that Valentines Day is one of the busiest days of the year for private investigators but that the real work comes directly after Valentine’s Day. “Once the other spouse finds the weird credit card charges or missing time that occurred on Valentine’s Day, they calls us”. Hodson added, “The true busy season starts right after Valentine’s Day”. “Credit card charges and missing time are the number one reasons for suspicions from our clients”, says Hodson.